Emma came to CMP after suffering injuries in a past car accident that changed her life, activity levels and body shape. Unprepared to accept defeat, Emma was determined to get herself back in to fitness, improve her and regain her body confidence. Well done on your Transformation Emma! How are you feeling? I never knew I’d be able to have so much positive energy, it’s made a big difference to how i feel on a daily basis and i love that all my clothes are fitting better rather than feeling tight and i just feel a lot fitter, stronger and happier overall. You were a keen runner before and had a car accident which set you back significantly, can you tell us a little about that? I’d fallen into a rut after the accident being unable to run and felt myself becoming unhappy with myself. Because intially i couldn’t exercise, it meant that i started to gain weight and body fat which was difficult as i wasn’t use to looking at a bigger version on myself. I knew i wanted to get back into the gym but also didn’t know where to start. I knew for sure that i didn’t want to injure myself further but wasn’t prepared to accept doing nothing. That’s when i decided that i wanted help from a professional fitness team and had heard about you! So why did you choose CMP? I saw you on facebook and felt it would be a good challenge to myself to become one of your transformations. I read through your posts and they resonated with me and I felt I ticked all the boxes you were talking about. I had a friend that had trained with you before so I got in touch with them and they spoke highly of you, that along with the other testimonials I read made me feel like i would be working with someone who could understand and help me achieve my goals of getting back into shape and to be pain free. Did you have any worries or doubts about starting a weight training program? Initially yes, as I thought I might bulk up lifting weights! I’d never had a proper education on weight training from the gyms that i had been to in the past beyond being shown the machines during the induction session, so really i didn’t have any idea of the huge benefits that weight training would have made to my body. In the past, i had mostly stuck to the cardio area so learning about weight training and muscles was a whole new thing for me. What’s the biggest thing you can take away from your experience at CMP? That nothing needs to be too complicated and restrictive! Mainly what i’ve learnt outside of learning how to lift weights properly is that you just need to stick to the basics of nutrition, you can still enjoy an active social life and get great results. 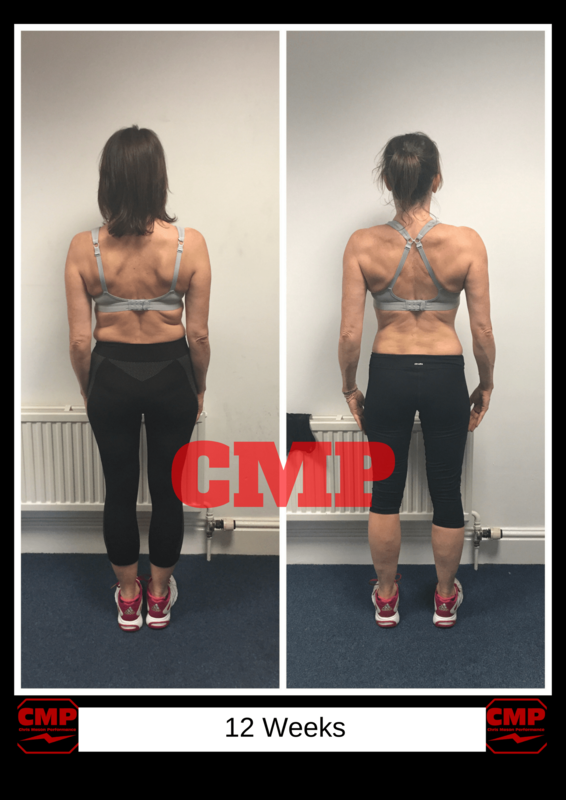 I’ve been amazed at the changes i have made to my body and now feel confident in carrying on what i’ve learnt at CMP. Also, i’ve learnt that weight training won’t make you bulky as a female! What would you say to anyone thinking of joining CMP? Pick up the phone and call them! They have made the unachievable, achievable for me. Once you are there put your trust in them to get you where you want to be.